A week ago, preparing to begin work on the rear suspension. 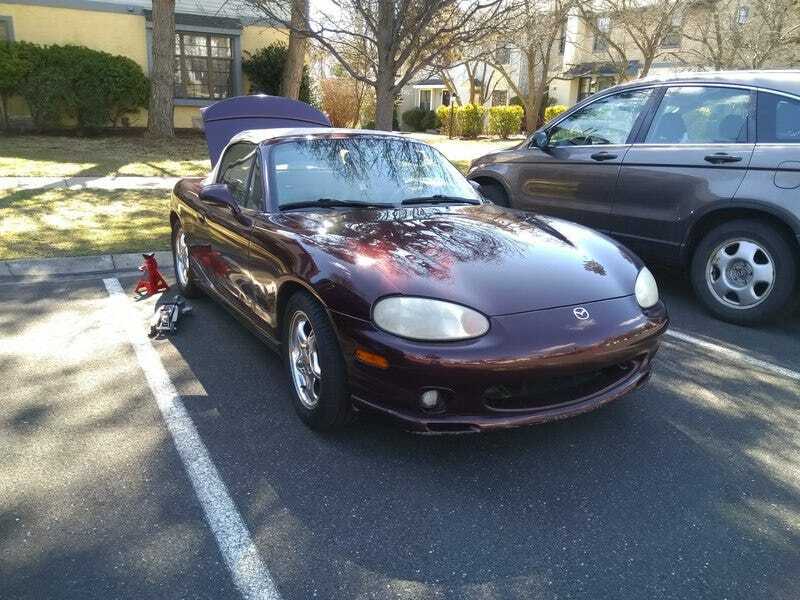 This is #377, a 2000 Miata MX-5 Special Edition that came from the factory with standard suspension, which after about 148,000 miles showed serious signs of sagging along with a harsh ride and daily excursions to the bump stops. I had planned on swapping the suspension last fall, but fall ended suddenly and so I rescheduled for spring, which here in Southeastern Pennsylvania began in earnest just over a week ago. I’m happy to say that it was worth the wait. As usual when I do any work on cars, the work began with the usual portage of tools from basement to lawn alongside the parking lot in front of my house. Fortunately I already had many of the necessary tools in the car’s trunk, so I brought those out and placed them on the lawn. Tools and parts laid out and ready to go to work. Mind you, not all of the tools shown here were used for this work. Since it’s the easier side, I started on the rear axle. The first thing to do here is to remove the trunk liner pieces and the plate that covers the fuel fill hose to expose the shocks’ top hats, immediately followed by removing the lock nuts on the shock shafts and loosening the shaft nuts. The nuts holding the top hats do not need to be loosened. This will come into play later. The fuel filler hose gets in the way a bit, but it’s not bad. A hex bit and an adjustable wrench (or a 17mm spanner) deal with the shock shaft nut. In the background is one of the famous trunk tunnels, which some people use to house subwoofers. With that done, we can now lift the rear end and begin disassembly. I placed the rear on jack stands and pulled the tires, exposing the rear suspension. Then, I went to disconnect the sway bar end links, which on a 19-year-old car in road salt country will not come off without destructive force. Up on jack stands, coffee on standby. This guy needs to go. The one on the other side too, but let’s not get ahead of ourselves now. This is my friend Grinder DeWalt. He suffers from a bit of jaundice but had a good appetite. After disconnecting the sway bars from the lower control arms, I compressed the suspension with the jack to release tension from the top hats, removed the shock shaft nuts, and lowered the suspension back. I then disconnected the upper control arms from the knuckles, which allowed the lower control arms to swing out. Step on the knuckle to lower the control arm, and the shock assembly comes out, with the spring already decompressed. Then it’s just a matter of removing the bolt holding the shock to the lower control arm before removing the assembly entirely. Knuckle disconnected, before swinging the shock out. Shock swung out, ready for removal. Here’s where I noticed how tired these springs were. The springs showed some rot, but most noticeably I couldn’t find any bump stops, or at least anything that looked like a bump stop. Was this sorry bit of rubbery foam a bump stop? It might have been a bump stop nineteen years ago. Nature has already begun reclamation procedures on this spring. Next up I started to assemble the new shocks with their springs and associated hardware. I bought a set of Koni STR-T shocks and was under the impression that these had a 10mm thread on the end of the piston rod, but alas, they do have 12mm rod ends like other Koni models. Nothing that some quick drill work can’t fix, though. Fortunately, I only had to drill the metal bushing caps; the rubber bushings went on the shaft unmodified with only a bit of manual encouragement. New and old shock piston rods, with their difference in diameter clearly visible. With the shock body, spring cup, shock boot, bump stop, lower bushing cap, and lower bushing assembled, I then mounted it on the lower control arm, stepped on the knuckle to swing the control arm down, and swung the shock assembly into place. Then I jacked the control arm to compress the spring and bring the shock shaft through the top hat, reattached the knuckle, installed the upper bushing and cap and screwed the nut onto the shaft. New shock absorber assembly in place and ready to be fastened to the top hat. Note the brown dots on the spring, indicating that these are Sport Package rear springs; standard rear springs have purple dots. Fastened to the top hat. Now back to the end links. I had only cut the end links at the control arm end, but still had them hanging from the sway bars. Here too I ground them off and prepared to install the new end links. The nut holding the end link is gone. A tap with the hammer knocked the end link off. Note the white paint on the control bar attachment tab — the grinder got a bit too hungry and bit into it a bit, so I sprayed it with Rust-Oleum to stave off rust some. One of the old end links on its way to the dumpster. Mevotech Supreme end link. It’s huge, and also zerks! Amazingly, they clear the springs through the entire range of travel. With both end links attached, it was then time to button everything up and lower the car. Something then immediately drew my attention: the rear end was now waaaay higher than before. Immediately after lowering the car. Huge gap is huge. After settling a bit, the gap has reduced, but still able to carry two lanes of the Pennsylvania Turnpike. At this point the sun was ready to set, so I cleaned up, stored the tools, and took the car out for a short test drive. The rake was evident even with the car stopped, but I confirmed there were no loose bits. From start to finish these two corners took me about seven hours, including prep and cleanup, which isn’t particularly impressive, but I did all of the work alone and took things slowly. Given how easy this was, I hoped that the front axle would be similarly straightforward. LOL, nope. Part 2 will cover the front end, which is where I shredded my knuckles and delayed the end a whole week.